Stokers Halt in Ballyhackmore village. Have you got Google Earth on your computer? If so, then download the Google Earth view of The Stokers Halt. Is this the wrong position for The Stokers Halt? If you think so, then modify its position. Click / Tap the button above to get directions from where you are to The Stokers Halt. Was at this restaurant last night with friends and the service was second to none. The food was fantastic and portion size was great. We enjoyed our experience very much and would be back again in future. 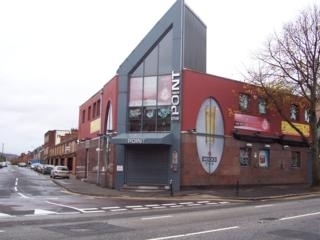 I had purchased a groupon voucher to use at The Point Bar, but unfortunately was ill and unable to use it. I rang and spoke to the manager to see if they could stand over the amount, his attitude was totally unsympathetic, a resounding no, so much for customer service. We have just been to The Point using a Groupon voucher. The meal was a "platter for two" which cost us £18 but was meant to be to a value of more than double that. We were so disappointed with the inferior amount and quality of the food. No one would ever want to return to The Point were that their only experience of it, and I am deeply saddened that a voucher idea should have been used to provide such a sub-standard meal. Thankfully, we have been to the Point before and know how good the food can be, but this was very disappointing indeed. Great bar on all fronts. However would like them to sell Carlsberg. It is also a tad expensive for the area- but all in all good spot. Have been in a few times- have to say excellent bar all round. The staff are good in getting you a drink and polite- good for sports and the food is not bad. I eat at the point every few weeks and have never had any problems. Food is lovely esp the steaks ! Staff are professional and friendly . great value for money ! Been to the point for food at least 20 times and never had a bad meal, its pub food presented in a modern way. Staff are friendly. Only minor complaint would be the bar itself isnt great. Dark and not a great place to watch football. this bar / restaurant has no, i repeat no disabled access to up stairs???!! !is this not illegal, and when i asked about it, i was given the excuse that it was built 8 years ago and thats why? ?how is this good enough, should be taken futher.basically crap and inexcusable and i am keeping my language clean here!!!!!! total sh*tho*e. the staff are so rude and the food is appalling. the wine is overpriced as is the food. Was off to a bad start when I asked if I could have the battered fish with salad. I was told by the waiter that this was not possible. My husband can boil an egg tops and even he could rustle up a salad - what was the problem? Instead opted for the butternut squash which tasted like it had spent the weekend convalescing in a plastic lunchbox. The lettuce leaf on which the squash sat was unappetisingly brown at the edges. Overall food hit and miss. Top tip for the waiter - Try to get out more often. Newtownards Road is not Covent Garden however hard you might want it to be. Very disappointed with the attitude of the staff at The Point. I realise the food may well be good but food should be good in any pub. Visitied The Point to watch an important match which they were advertising (Champions League Quarter Final football). Had to ask three times to get the volume turned up and they would not turn it to an audible level all evening. And it was clear that most people there, were there to watch the game on the many screens they have displayed around the pub. A childish attitude by the staff - as soon as the game was over - it was straight on with the karaoke - as loud as the speakers could handle. I have been there so many times and am never disappointed. I have never had a bad meal there yet. I hope their level of service continues, the staff are welcoming, polite and friendly. Food is excellent and the staff are always friendly and welcoming. Highly recommend it, well worth a visit. Always excellent service and excellent food. Very nice surroundings. Have been using this restaurant from it opened. Only downfall now I feel is the children's menu portions have decreased in size dramatically.